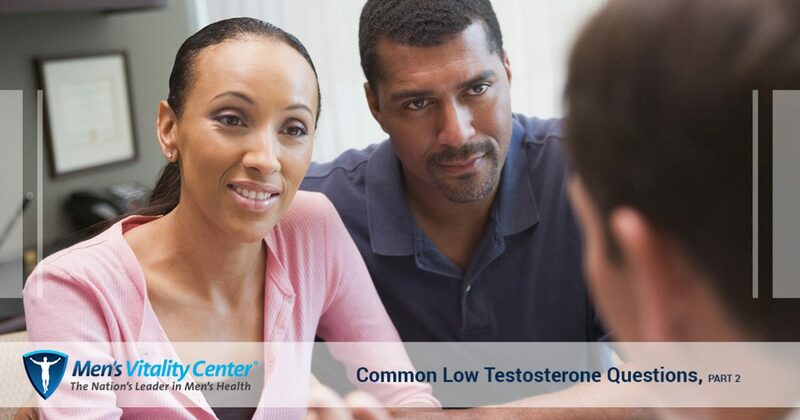 Depending on where you look, it can be difficult and frustrating to find reliable information about low testosterone and testosterone replacement therapy. In our previous blog, we answered three of the most common questions we receive regarding these topics. Today’s blog post will continue on that same theme, and we will answer a few more of the most common questions our physicians receive. Men’s Vitality Center in Glendale offers a variety of men’s health services, including weight loss management, prostate exams, and diabetes management. We have helped thousands of men around Arizona restore their testosterone levels, and we would love to help you get back to feeling your best. Contact our office by phone or email today to schedule an appointment. The first step in your diagnosis will be providing your doctor with a list of the symptoms you are experiencing, and your doctor will recommend a blood test if they suspect that your symptoms are caused by low testosterone. Normal testosterone levels range from 300 ng/dL to 1,000 ng/dL, and they can fluctuate throughout the day. Your doctor will likely schedule your blood test in the morning to ensure an accurate reading. Will Testosterone Replacement Therapy Improve My Libido? While every individual is different, it is likely that you will see an increase in your libido within 14 to 21 days of beginning testosterone replacement therapy. Low testosterone levels are one of the most common causes of low libido, and many men report feeling a nearly instantaneous increase in their libido after beginning treatment. Is There a Connection Between Weight and Testosterone Levels? The connection between bodyweight and testosterone levels is complex, but the short answer is that yes, your weight may be causing low testosterone levels. High levels of body fat, particularly around the midsection, inhibit the body’s ability to produce testosterone efficiently. Low testosterone levels also contribute to feelings of demotivation and lethargy, which can make it substantially more difficult to maintain an active lifestyle. How Can I Naturally Raise My Testosterone Levels? While testosterone replacement therapy is the best way to restore severely low testosterone levels, there are several things you can do to raise your testosterone levels naturally. High-intensity interval training, also known as HIIT, prompts the body to release endorphins and hormones, including testosterone. Full-body exercises such as squats and deadlifts that engage large muscle groups are also a fantastic way to prompt your body to produce more testosterone. If you’re looking for ways to increase your testosterone levels through your diet, try eating foods rich in healthy fats such as avocados and coconut oil. Speak with your physician during your initial appointment about other ways that you can raise your testosterone levels naturally. We hope that this post has answered any questions you may have had about low testosterone and testosterone replacement therapy. If you still have questions, or if you are concerned about your testosterone levels, contact a member of Men’s Vitality Center in Glendale today! We’ll help you get back to feeling healthy and energetic.